At 14 months old, Alice’s parents noticed that she stopped using her right hand. After a trip to the pediatrician, she was incorrectly diagnosed with a broken wrist and received a cast. After the cast came off, she started having trouble walking. Alice had been extremely healthy since birth, so it was a shock when an MRI revealed a large mass in her left front temporal lobe. After only a few hours’ notice, in December of 2016, Alice’s family drove through a winter storm from their home in Grand Junction to Children’s Hospital Colorado for an emergency tumor resection. The brain surgery lasted for six hours. Always the charmer, Alice managed to offer a weak “hi” and wave to her nurse when first waking. Where previously she was starting to walk, after the surgery Alice was struggling to crawl, and she soon began a long and intensive therapy regimen. In addition, four days before Christmas 2016, the tumor was identified as an Atypical Teratoid Rhabdoid Tumor (ATRT), a very rare and aggressive form of cancer that generally occurs in children under the age of three. Over the next 9 months, Alice endured two rounds of chemotherapy, six weeks of focal radiation, and three rounds of high dose chemotherapy with analogous stem cell transplant. She came through it all with no sign of recurrence with the help of the amazing doctors and nurses at Children’s Colorado, although she will have frequent precautionary MRIs and checkups going forward due to the aggressiveness of the cancer. A year out of treatment, Alice is working hard to overcome speech delays, right sided hemi-paresis, and partial vision loss with therapy every day. 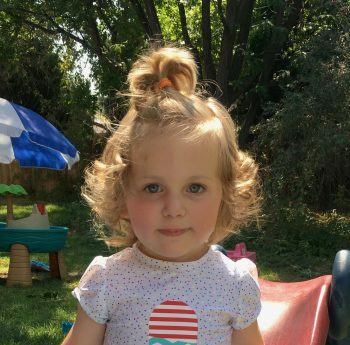 Alice started preschool in Fall 2018 after her third birthday.